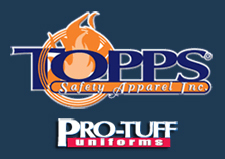 Topps Safety Apparel, Inc., a leading manufacturer of Public Safety and Flame Resistant Industrial Apparel, offers a complete range of flame resistant and public safety garments. Topps has flame resistant garments offering varying levels of protection, depending on the individual requirements of the working situation. In May 2004, Pro-Tuff Uniforms was acquired by Topps Safety Apparel, Inc. and now works closely with Topps in all areas of operation. Pro-Tuff Uniforms maintains its own manufacturing facility in Burkesville, Kentucky where the unique blend of innovative styling and the highest levels of product quality are combined. Design and manufacturing standards are now guaranteed by quality assurance procedures that are registered as in confor-mance with ISO 9001.